The ease with which Rental Vision can be flexibly configured to cope with virtually any rental situation means that it can provide the ideal solution for a whole range of applications. Existing program users have used it to manage operations as diverse as toy/game hire, audiovisual rental, medical equipment rental, power tool rental, cleaning supplies rental, etc. The software features easy customer and rental stock management and streamlines all processes in the rental cycle including but not limited to reservations, customer account and deposit management, rental and return. The program also offers a number of options that allow you to run a website for your store. Please click/tap on a thumbnail to view a full size version of that image. The program's main interface is intuitive to use and has the most important functions arranged conveniently on two separate toolbars (fully configurable in terms of the buttons shown) on the left hand side and top of the main screen. 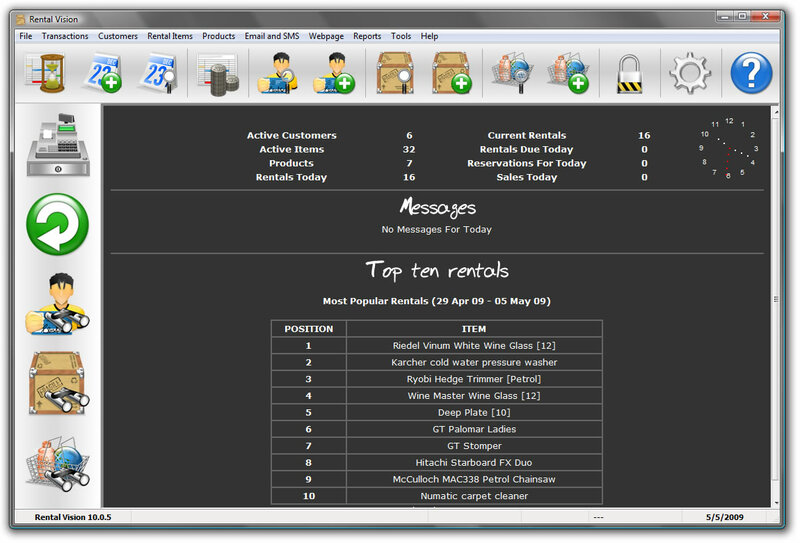 A webpage style main window can be configured to provide a summary of key information, messages to staff, pending reservations, and a top 10 rentals chart. The transaction screen provides all the tools needed to ensure that each transaction is fast and efficient. Barcode reading is supported, as is the display of customer photographs for extra security. 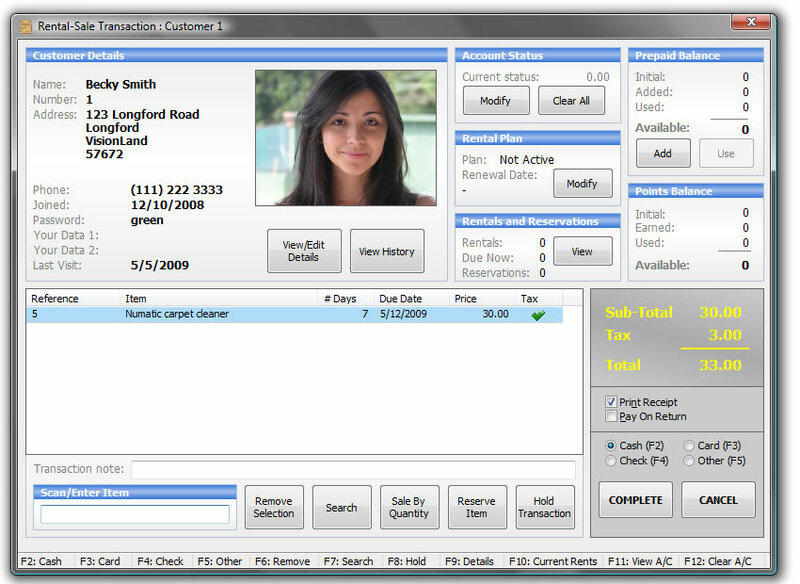 Core features included in the program include an intuitive Windows interface that is extremely simple to learn and use, integrated reservations and deposit taking, event planning, password protected functions, overdue rental monitoring and late fee calculation, customer account management, barcode scanner support, barcode designing and printing, management reporting, a range of promotional tools (including multi-rental discounts and a Frequent Rental Points scheme), customer photo capture, customer membership card creation (with photo and barcode), full saleable stock control features, full rental histories, and much, much more. With the appropriate license purchase, Rental Vision can be run on multiple terminals sharing a single database on your Windows network. A number of impressive add-on modules are available to use alongside the program, designed to further empower control of your store, improve customer experience, or drive increases in revenue.